You’re in the middle of designing and planning a new warehouse. How much will that boost capacity? And did the cycle side of the business play a part in the need to increase space? Our warehouse extension will double our footprint to 90,000 square foot. Thankfully, our cycle products are not as ‘space-hungry’ as some of our other products. However, because both the product range and the sales volume are increasing so healthily, they will take up their fair share of the extra warehouse space. The worst culprit will be cycle helmets; thanks to the success of our existing models, we have invested in a much bigger and more ambitious range for 2013. On top of that, we have a very innovative range of Animal Planet helmets and accessories to house… more on that later. For the cycle side of the business, you’ve been investing in people too. In what key areas have they joined? Sales? Design? We have beefed up our human resources in three specific areas in order to support our cycle plans: Product design, product sourcing; brand management and sales. Product design is incredibly exciting, as we have invested in a licensing and lifestyle product specialist in Jo Partlett. She is the source of our huge new range of performance neckwear and the Animal Planet licensing project, among other exciting things. We’ve got a technical design engineer, Mark Eaton bringing nearly 20 years of experience of designing and rendering complicated components via CAD – this enables us to rapidly develop a plethora of bespoke products. And we’ve now recruited a clothing designer, Scott Macfarlane, who comes to Oxford with over 15 years of experience designing technical clothing, primarily in the two-wheeled world. Cycle product sourcing is now supported by a highly experienced, dedicated buyer – with the huge advantage of being fluent in both Cantonese and Mandarin, Jane Tan has in a very short time revolutionised the way Oxford purchases its 2,000-plus cycle products. Brand management and sales have been boosted by not one, but two entirely focused individuals: working under industry legend Martin Sykes, Paul Bowyer and Mark Porter run the product and sales development of the Oxford cycle brand. Both have one foot in the field and one in the office to ensure that the product and brand offering match up with the requirements of the market. How many of the Oxford ranges are designed in-house? All of our products have an element of in-house design, but our primary focus for the next five years is to develop completely unique product designs – where possible and relevant – with an obvious competitive advantage and added value. Currently about 90 per cent of our motorcycle products are completely unique, whereas the figure is more like ten per cent in the cycle range. Put simply, step-by-step, we wish to replicate the motorcycle per centage in our cycle range. One central area of change has been the launch of co-ordinated ranges in a reorganisation of your line-up, including Darxide, Full Stop, etc. What led to the decision to split up the offering like that? Step one in our re-organisation of the combined product portfolios of Oxford and Sprint was to secure good supply of all products under one coordinated brand image. Mission accomplished! Step two is a focus on building value by creating expertise in certain areas; this specialism is communicated by compartmentalising product ranges into sub-brands with their own bespoke image. Can you tell us a bit about each brand? “Darxide” is our BMX range of accessories and hard parts, with a suitably grungy colour scheme. “Full Stop” is our new range of brake components and “Livewire” is our new cable range, both with matching impactful red packaging, both presented in a way which communicates the thoughtful design and careful selection of materials which have gone into the final product. “Torque” is our precision engineered tool range, made from 6061 aluminum and hardened chrome vanadium and complete with its own technical brand image. Will the brand reorganisation mean an end to Oxford Product-branded products? Never! All of these ranges carry their own colour scheme, but remain recognisably part of the same Oxford “brand family”. Not only the Oxford Products logo, but the underlying format of the packaging remains consistent throughout, so that, although the ranges carry their own clear identity, they look seamless when displayed alongside each other in-store. In terms of the product line-up, is there any gaps in the Oxford range you’re looking to plug in the short-term? Oxford is also growing some licensing opportunities – as with Animal Planet. Are there any more in the works? What’s the attraction of working with a brand like Animal Planet? Animal Planet is the first licensing project to be landed by our newly expanded product department and will hopefully be the first of many. The beauty of Animal Planet is the clear differentiation it provides from run-of-the-mill kids’ licenses, both from a brand and product point of view. To explain; most kids’ brands are about instant gratification, mindless entertainment – just throw your children in front of the telly to absorb it. Animal Planet is one of the few truly educational licenses, where children are encouraged to engage with the natural world and ask questions. The product we have created answers these questions with a realistic representation of the animal, not just a few stickers slapped on a bog standard helmet shell. In order to achieve this, we have had to invest heavily not just in 3D CAD design, but also in new silicone technology to form the life-like helmets. The result is a product which parents can feel good about on every level, not just safety. You called the cycle market a sleeping giant for Oxford Products. How are you planning to wake it up? You’ve probably got a fairly good handle on this from all the activities outlined above. With the level of investment described, we are able to simultaneously tackle so many of the opportunities presented by the cycle market. Even more importantly, working very closely with our distribution partners, we can ensure that the results are what the market demands. 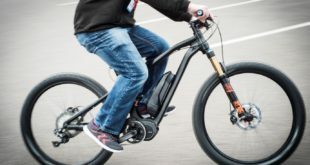 The long-term result will not only be a greatly demanded (and expanded) range of products, but a newly emerged and powerful cycle consumer brand – Oxford. Once that is achieved, anything is possible.